We pride ourselves in providing you and your family with quality equipment that doesn’t look or feel like rentals. All of our skis are “shape skis” which makes your skiing experience easier and more enjoyable. For our demo equipment, we keep ourselves on the cutting edge of trends and technology including offering women’s specific and all mountain skis from most major brands. Listed below are our daily packages which combines custom fit skis, boots and poles and snowboard and boots. 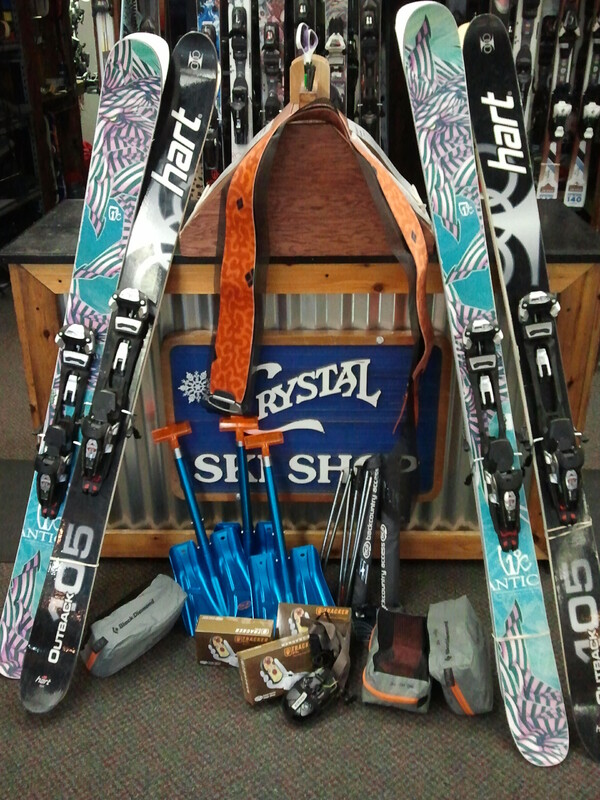 We also offer all equipment on an “a la carte” basis so if you have your own boots, we can fit our skis to your boots. Please call or email us if you have any questions about prices or equipment. Rossignol Touring Nordic Skis- non-metal edge classic waxless skis, NNN Bindings, Rossignol Boots. Rossigonl Touring Nordic Skis Metal edge back country wax-less skis, NNN-BC Bindings, Rossignol Boots. Rossignol Touring Nordic Skis, NNN Bindings, Rossignol Boots. Crescent Moon Snowshoes, fits virtually any boot or shoe, comes in three sizes for adults, poles optional. Crescent Moon Snowshoes, fits kids under 80lbs, fits most boots and shoes, poles optional.